For the Early Bird HAB Payload I need a camera that will survive the low temperatures encountered at altitude. 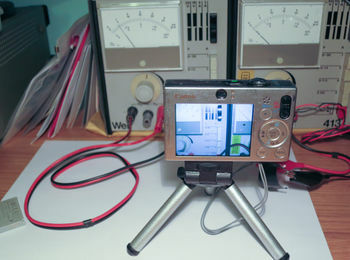 Following a disappointing result from the cold-temperature battery test with my Canon SD1000 (34mins VS 4h49m at Room Temperature), I needed an alternative power supply solution. The Canon SD1000 does not accept power through the USB port, or any other accessory socket. 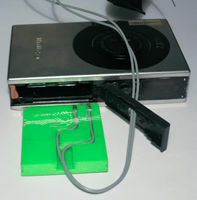 The battery door contains a hole for wiring, implying that the official solution was to provide a 'fake battery' for the camera, with a DC supply hooked up in place. To achieve this I have designed a Boost Regulator into the Early Bird Tracker PCB to supply ~3.9V to emulate a reasonably charged Li-ion Cell. The next challenge however was going to be to reliably make contact with the battery contacts deep within the camera (no way to fit a soldering iron in there!) The answer therefore was to make a battery-size object to fit snugly in pace. I decided I was going to do this properly, and take advantage of this opportunity to try out the hobby of 3D Printing. Thanks to the guys at SoMakeIt for letting this total stranger loose on their Lulzbot Taz for the evening! 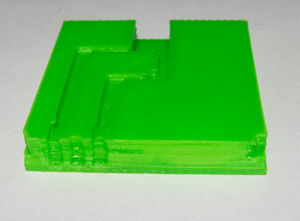 To model the part, I used OpenSCAD. Although not the most intuitive program to use, this design could be easily built from the cubes that form the basis of the syntax, and so was surprisingly simple to create. I did briefly look into doing curves for the wiring channels - but it seems these are well outside of OpenSCAD's comfort zone! I then exported the STL from OpenSCAD, and loaded this into the experimental version of Slic5r to apply the printer configuration. 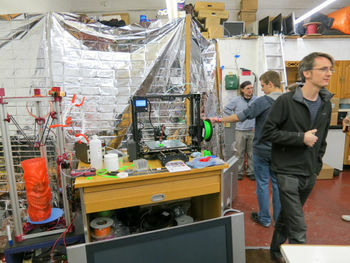 I had heard about the Southampton Makerspace/Hackerspace, known as SoMakeIt, since they moved into a dedicated unit last year, but until now I hadn't had much motivation to visit. 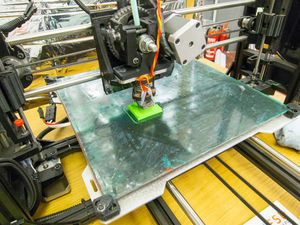 This project presented the perfect opportunity to check out their new, larger space, meet people and to borrow the use of one of their 2 large 3D Printers for an evening. Thanks to some dedicated members, and a recent competition, the Makerspace has both a Cerberus Delta (usually set up for PLA), and a Lulzbot Taz (set up for ABS). 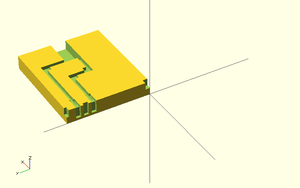 I had no idea what material to use, so used the Slic5r Configurations from their wiki to export the gcode for all the possible combinations onto an SD card, and went along. They were very friendly and after being shown around and introduced to a few people, I was pointed towards the Taz and suggested to give it a go using the instructions on the wiki. I confidently walked up and inserted the SD card with the gcode files. Of course the Controller screen only showed the first 20 characters of the filenames, and so all my files were indistinguishable. 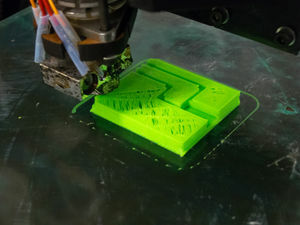 Getting my laptop out to correct this gave the Taz some time to preheat ready for the print. First ever 3D print! 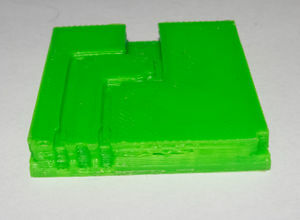 Used default 'fast' print settings from the SoMakeIt Wiki. 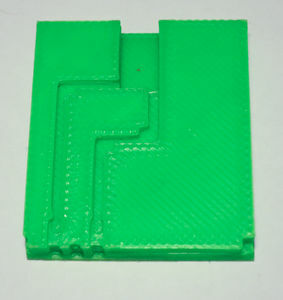 Slowed down the Perimeter print speed to achieve better accuracy on the vertical edges. 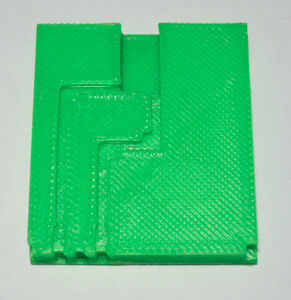 Lowered the fill density to speed up printing time - Structural strength is not a great concern for this part. This also had the bonus of reducing the weight slightly. This slightly improved the definition of the indentations for the contacts, and reduced the weight to 4.1g (from 5.0g). For some reason the result required some filing to fit in the camera, but only 30 seconds worth. My original plan was to use copper tape, however with none lying around I found by luck that my Desoldering Braid was the exact width required for the contacts. 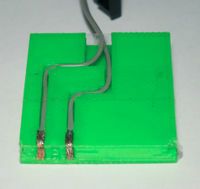 I carefully soldered the wires to the back of the braid, taking care not to allow the solder to flow down the Braid. This then allowed me to put the wire in place before bending the braid easily over the corner and trimming to length. Despite my efforts there was some solder in the braid, however this caused it to be just stiff enough to hold the shape perfectly! 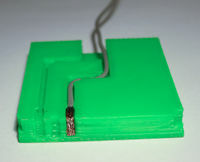 The slight overhang of the edges in the wiring channels helped greatly in holding the wire in place. The tape is unnecessary except over the joints where it prevents contact with a metal face inside the camera, however it does make for a satisfyingly snug fit. 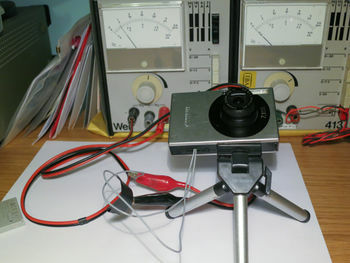 After having checked the polarity against the stock battery, labelled the negative, and checked again, (I really should buy some coloured wire..) I set the power supply for 3.9V, connected it up and switched it on. In my haste I had at first forgot about the requirement for the battery door to be closed for the camera to power up. With the battery door closed, the camera came to life! Peak current draw seemed to be during the lens extension on power-up and was in the region of 450mA. This dropped down to ~300mA with the screen on, and ~75mA with it off. I hope the boost regulator on the Early Bird Tracker PCB will be able to handle this! This page was last modified on 21 January 2015, at 02:59.